While West Coast trips can be pricey, the budget-conscious traveler can still take in Seattle’s best. Mountain views, urban hikes, and tasty food await the savvy traveler. The Space Needle costs $16 for one adult and, in my opinion, is highly overrated. For $7.50, head up to the observation deck at the Smith Tower in Seattle’s historical Pioneer Square neighborhood instead. You’ll get a great view of Puget Sound, the Cascades, the Olympic Range, Mount Rainier, and downtown Seattle. For just $5 on weekdays, you can also access the observation deck at Columbia Tower — the tallest building in the Pacific Northwest. There may not be 360-degree views, but it still beats the Needle. With a little extra planning, you can avoid an expensive rental car and exorbitant parking fees. 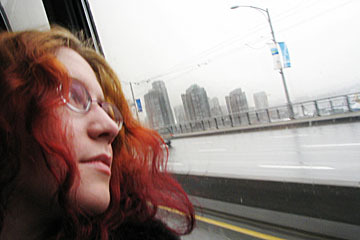 Seattle’s metro buses will get you anywhere you need to go, and they’re (mostly) on time. Prices are $2 for peak hours and $1.75 for other times, although in the downtown core buses are free of charge from 6am to 7pm. Not sure you can do it? Relax, they’ve made it easy for newbies. First, check out the King County Metro Guide, then use Google Maps or King County’s online Trip Planner to find a route. You can also use One Bus Away, either online or by phone, to see if your ride is on schedule. Drivers are generally considerate and helpful, so feel free to ask questions or directions. The best way to save money and get a little exercise is to walk; downtown Seattle is compact and easy to navigate. Make sure you wear comfortable shoes for the hills! National Parks charge an entrance fee, but Seattle’s urban parks won’t cost you a cent. Puget Sound’s Discovery Park is close to downtown and contains 12 miles of hiking trails, a lighthouse, steep bluffs, beaches, mountain views, sand dunes, forest, streams, and meadows. 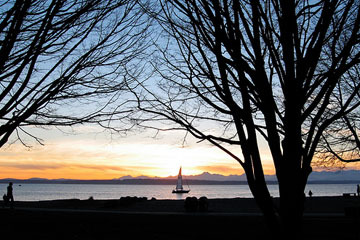 If you’re looking for a lazy way to spend a sunset, try Golden Gardens’ beach with views of the Olympics, or Kerry Park‘s postcard view of downtown and Mt. Rainier. Buses run regularly to each of the parks. For under $10 (and sometimes under $5), you can buy your fill of pho (Vietnamese noodle soup), sweet and sour chicken, bubble tea, or Vietnamese sandwiches in the International District, just south of downtown. Plus, as a true pan-Asian neighborhood, the ID is worth a ramble. From the teashops to the obligatory Chinatown gate, and on to the dragons climbing the light posts, you can spend an entire afternoon in the district. At Uwajimaya, the giant Asian supermarket, you’ll get lost in the aisles of noodles, sake, and Hello Kitty merchandise. For a belly full of cheap food, try Ga Ga Loc (Chinese), Green Leaf (Vietnamese), or happy hour at Kaname Izakaya (Japanese). Several Seattle museums are free the first Thursday of every month. Schedule your visit right and you can get into the Experience Music Project, the Museum of Flight, the Seattle Art Museum, and more, all free of charge. For a complete list of museums and their hours, check out this useful Seattle Times article. Seattle’s major points of interest are free. 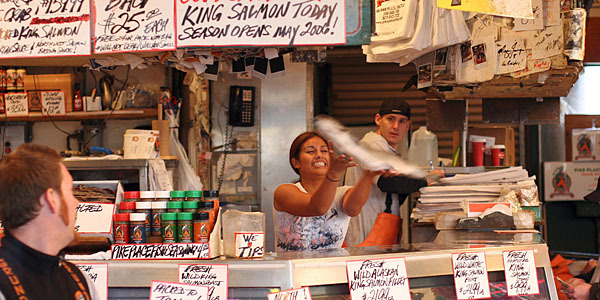 It’s impossible to pass up famous Pike Place Market, where you can sample fresh local food, gaze upon the colorful flower arrangements, browse nearly 200 craft vendors, listen to street performers, and watch the “Fish Guys” toss seafood at the Fish Market. A few blocks away, explore the neon escalators and bizarre chambers of downtown’s Central Library, in all its geometric glory. 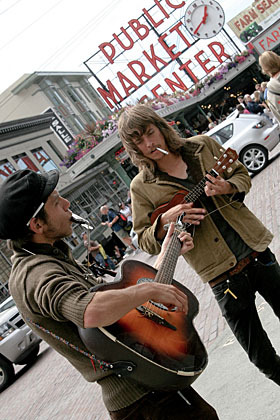 Seattle’s Ballard neighborhood is charming and walkable, with Nordic influences and cozy coffee shops and pubs. The Ballard Locks, where local and Alaskan fishing ships pass and salmon swim the fish ladder, is free to the public. The neighborhood of Fremont is famous for its public art including the Fremont Troll, an imposing Vladimir Lenin, and the oft-decorated Waiting for the Interurban. Just a short walking distance away is Gas Works Park, where locals fly kites or picnic on the hills with a backdrop of Lake Union’s sailboats and the skyline. When to go: Locals promise sun-soaked summers from July 4 until Labor Day, but June and September can also be mild and sunny. If cheap and free is your kind of price, find out how you can visit Berlin on the Cheap and check out 10 Volunteer Opportunities For Free Travel.